One of the things I had to give up when I left LA was my membership to the local Crossfit gym. I’ve enjoyed a break from the intensity of daily WODs while finding strength and flexibility in my yoga practice and inspiration while exploring the great outdoors. 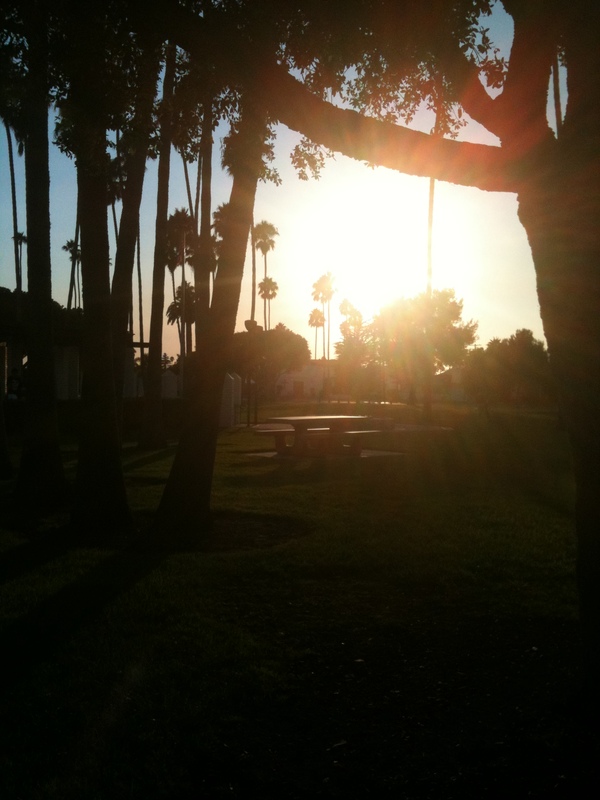 Now that I’m here in sunny San Clemente I’ve got a little issue… I have a TON of free time! I know, i know. Poor Nikki, life must be rough. Whatever. It is what it is and I need to do something about it to keep from going crazy. My solution: To begin incorporating some High Intensity Interval Training (a la Crossfit Metcons) into my days. In an effort to keep it simple I’ve chosen to steer clear of the gym and explore my inner coach and the beautiful outdoor scenery. Even though I lack the handy equipment of a crossfit gym, I do have a couple of great (free) resources. Dips, crunches, situps, bicycle crunches, planks, lemon squeezers, v-holds, etc. I’ve been programming my own weekly workouts for myself and my husband. It’s been really fun so far! We warm up a bit, then our workouts usually last about 10-15 mins. My days are pretty active because I walk everywhere. I’ve made a promise to myself, and all of Creation, to not drive my car in San Clemente. Exceptions include: my weekly commute to LA on monday’s, back on Tuesday’s, random adventures down to San Diego, and my yoga classes. In the morning I’ll go for a walk, then do a little WOD, and then go to yoga after. Once he’s home from work, my husband and I will do another WOD and then eat dinner. FOOD SIDETRACK: the taco stand down the street has a LO-CARB CUP! WHAT!? It’s carne asada, guacamole, and salsa. HECK YES! You get the idea. There’s no heavy lifting going on, but I’m pretty confident that between the yoga, surfing, HiiT workouts, and general walking around town I’ll be able to maintain a pretty awesome level of fitness. The cool thing is, anyone can do this. You don’t need to have weights, kettlebells, barbells, and rowing machines to achieve great health. By giving your body excellent food, sunshine, fresh air, a little bit of resistance training, some low-level movement throughout the day, and some deep, mindful stretching, you are definitely ahead of the curve when it comes to health and wellness. With summer coming to an end (well, sort of. It is Southern California) I want to share a recipe using some summer fruits. Get um while you can because peaches and plums just don’t taste good out of season. 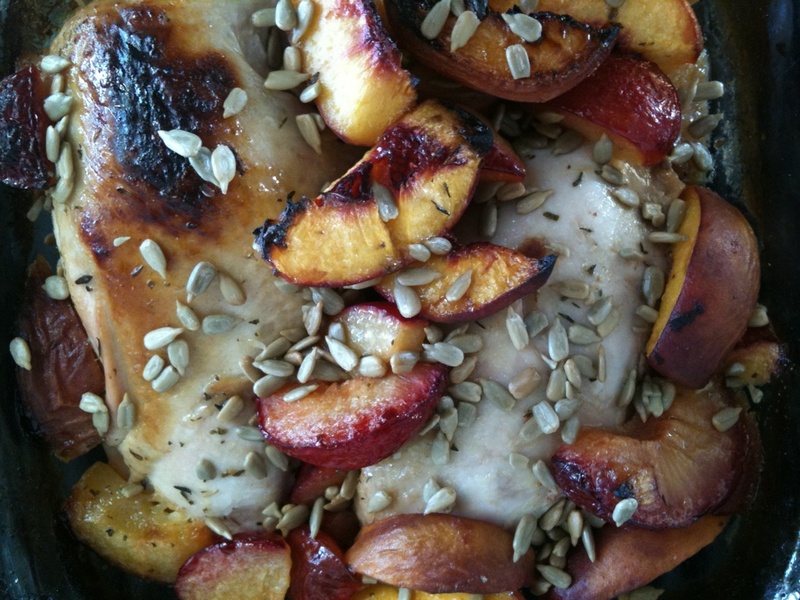 If you want to make this out of season, you can always buy frozen peaches for the same effect. In small bowl, whisk together lemon juice, honey, olive oil, garlic, mustard, thyme, ginger. Place chicken breasts in a glass baking dish and season with salt and pepper, then pour over 3/4 of the lemon mixture. Turn to coat well. 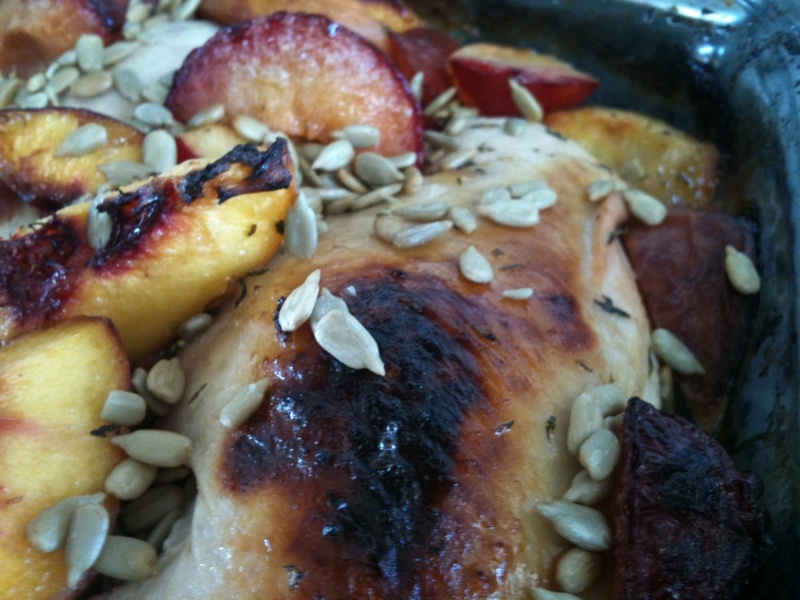 Top chicken with peaches and plums and pour over the rest of the mixture. Bake for another 15-20 mins until fruit is carmelized, chicken skin is crispy, and juices run clear (if using a meat thermometer, look for a temp of 155. Serve with some sautéed greens or spicy carrot puree!